„What you see, is what you get“ – this is not always the case, when looking at Emanuel Bernstone’s contribution to „Paper Positions“. On view at XPositions 2016, a show concentrating on works on paper concurrent with Berlin’s Gallery Weekend, Bernstone shows his latest three dimensional installation Mont Blanc. The title is repeated several times within the collage of 50x70cm sheets, in form of the classic logo of the German company that specializes in fine writing utensils. 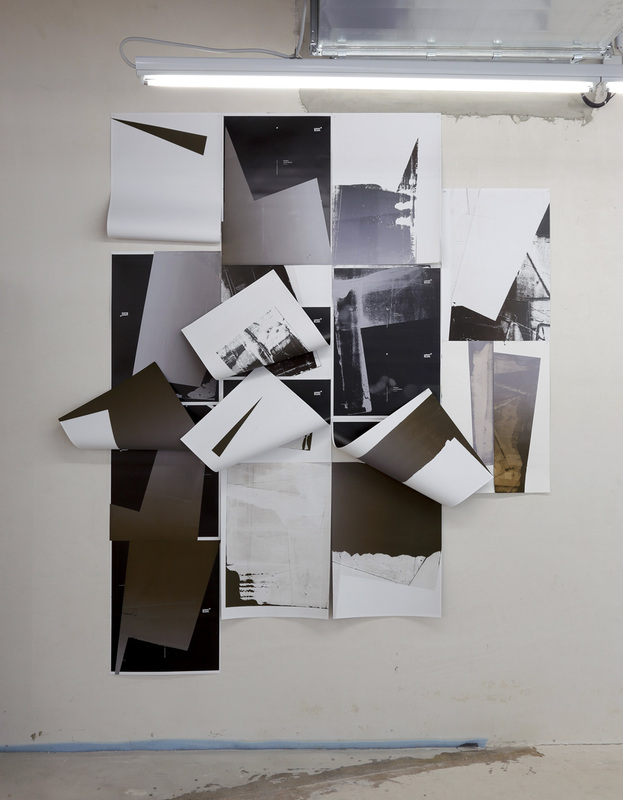 That may be all there is to it – assorted sheets of paper, some folded into protruding shapes, tainted in black, white, bronze and assorted on the wall with a logo we associate with paper, or rather the writing on it. Yet there is a dynamic here that calls for closer examination. Bernstone stays true to his faith in the creative process, a process in which he uses and re-uses screens to apply paint to canvas when not working on paper. It is precisely the random unforeseen he preys on when repeatedly employing screens to reach a point, a moment that satisfies the artist in his quest for an essence to surface from his oil painting in the abstract. And random too is the Mont Blanc theme, as it may be random for a printer below the artist’s Kreuzberg studio to be discarding piles of copy ad for Mont Blanc. Both the ad and its blank paper reverse are reborn in Bernstone‘s act of recycling creation itself.